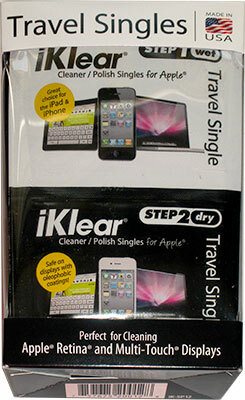 iKlear - Travel Singles Wet/Dry with Antimicrobial Microfiber Cloth. Perfect for cleaning iPhones, iPads, Laptops & preserving the Retina and Multi-Touch Displays on the Go. Convenient for iPhones, iPads ,Laptops, MacBook models, Desktops. Washable and reusable microfibre cloth. Twelve (12) iKlear Travel Singles (wet/dry).